Overview : The X3Max is a revolutionary USB development board. The X3Max has a 32bit MCU (processor) and 128KB of memory in which to store user hex, these features are unparalleled and not available in any other USB development board. This powerful hardware specification provides the extensibility required to ensure a future proof solution that will be able to keep up with the latest advances in code development. The X3Max also has an inbuilt MicroSD(HC) slot which provides even further expandability! With the custom X3Tool programming/flashing software, simple tasks such as uploading hex to the X3 Max are extremely simple as showed in our guide, no drivers are required, simply download the X3Tool software, plug the X3Max in to your computer and flash! While the X3Max is very simple to use for the end user who just wants to upload pre-made hex to the board, the combination of the powerful X3Max hardware and X3Tool software means that tasks undertaken by developers and advanced users such as editing the payload can be done right from within the X3Tool software! No complicated multi-software solutions are required. The X3Max comes complete in a sturdy plastic presentation case along with a free screwdriver used to open the casing. THIS DOES NOT WORK ON FIRMWARE 3.42 OR ABOVE UNTIL A NEW EXPLOIT/METHOD IS FOUND! The X3Max is compatible with all models and regions including: USA, JAP, PAL, and Korea. The X3Max is expandable with expansion port - Onboard microSD Slot (will support 32GB SDHC) for future programming capabilities! Installing the X3Max is as easy as plugging in a USB flash drive, the process is completely solderless and does not void your warranty. The X3Max an open source project and therefore is compatible with all third party developers firmware. All Official builds are tested thoroughly by our team before released to ensure they are stable and bug free. Frequent updates by our team and other members of the community combined with X3Tool V2 makes the update process easy, even for novices. X3Max has an easy to use Firmware updater that will soon be available for multiple OS. X3Max team provides pre-compiled, tested and certified firmware files that you can trust to run on your X3Max. X3Max has a simple Payload Editor Application that makes it easy to edit and add custom payloads. X3Max has built-in debugging including USB protocol analyzer so you can easily troubleshoot your payloads. Quality/Usability : X3Max was originally known as x3Jailbreak. Lots of people thought it was a fake and a hoax. But I think as the X3 team released more information, people started to take them more serious. X3 released a old sample which was similar to other jailbreak dongles but decided to stand out from the rest of the crop. Usually, USB jailbreak devices have 32kb of program memory. The Teensy++ 2.0 has 128kb and is the preferred choice by PS3 hackers. 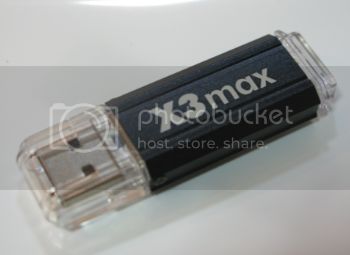 However, X3Max released their own 128kb USB development board. But there's more to it...they also included a microSD(HC) slot that supports up to 32GB! This is a first in the scene. However, for the tech savvy, you can purchase a SD adapter and solder it onto the Teensy but the X3Max does not require any work on your part. The microSD(HC) slot is simply accessed by unscrewing (with free included screwdriver) the casing and sliding off the aluminum case. Honestly, this screwdriver is cheap and crap. I suggest using tools from a eyeglass repair kit. I almost stripped the screws using the tool. With the cap off, the board would shift around. I even tried using it without the screw in place but its needed. When the X3Max is plugged into a USB port, obviously, the only place for you to grab would be the aluminum casing. So when you try to pull the X3Max dongle out, all you're left with in your hands is the case and the X3Max still in the USB port. So like all our reviews, we put each product through different tests to see what they do and how it can be improved, if any (we do our best to help manufacturers so that customers get the best product and they know what to expect if they purchase). There wasn't much information provided to us about the microSD(HC) slot other than what you have read above. So I had to do some figuring out myself and I came up empty. I inserted a SanDisk 2GB microSD card and when plugged into the PC, nothing pops up as a USB storage. Tried plugging it into the PS3 to see if the microSD is recognized, same thing. Nothing. I've contacted my source at X3Max and they will be getting in contact with the engineers as to when, how, what and more information about this feature. As of now, it seems to be non-operational. Its not used for dual booting payloads as you can load both Hermes v4b and KaKaRoTo PL3 on to the 128kb memory. The only thing I can think of is being used as a USB storage device built in. We'll update this one we get more information and have tested it out. The location of the microSD slot is a big flaw in the design. Anytime you want to get to the microSD, you would need to remove the case. *NOTE: When I first reviewed the X3Max, I had problems loading any Hermes payload. However, after working with X3Max and trying to solve the problem, X3Max has released a new Generic.bin file which I have attached. Now, ALL hex's do really work. I have tried multiple Hermes hex files and didn't have any problems. Download the necessary files above. Remove rear plastic cap and toggle the switch on the back of the X3Max to the ON position (Right - closest to edge. This is the Programming/Bootloader mode). Once X3 Tool is loaded, you'll see "Connected" (If not connected, then your switch is not in the ON position). To use the new Generic Hex Flashing functionality you will need to first flash a new firmware with the latest 'x3MAX_Generic.bin" file under 'Load Firmware'. This file is included with the Programming Tool and you only need to do this once. Once this is complete, click the 'Open Hex' button under 'Load Payload' or 'Open' button under 'Load Firmware' and load any .hex or .bin file, respectively. If this was a valid hex file you will see the descriptor data loaded. Click 'Program' once again to flash your .hex or .bin file. Once the program has transferred the file to your X3Max, you will get a message that says "PROGRAMMING PAYLOAD COMPLETE" for .hex or "PROGRAMMING FIRMWARE COMPLETE" for .bin. Don't forget to set back the switch to the OFF position (left side, closest to middle) and run on your PS3 and enjoy! There is no way to flip the switch with the cap on. You would need to remove the back cap just to be able to access the switch. This can be a hassle for those who like to try different HEX files. I used "any .hex or .bin" loosely as the file size for a Hermes v4b HEX file for a PIC18F was "too big". The file size was only 39kb where as a Teensy++ 2.0 HEX file was only 34kb. So its more like "majority" or "99.9%" of .hex or .bin files. The LED (which should have been red and blue initially) will change to blue. In order to make sure the X3Max dongle worked flawlessly, I had to uninstall all my homebrew applications that I had originally installed. To install applications or any homebrew applications, you will need to download and save the .pkg files to a USB drive such as thumbdrive or harddrive. To install, simply insert USB drive to the PS3 and navigate to "INSTALL PACKAGE FILES" on the XMB under GAME. Select the file you want to install by pressing X and it will automatically install the file. All applications installed and loaded without any problems. When the X3Max is connected to the PS3, you'll see a blue LED. This confirms that the jailbreak was successful. If it does not light up, repeat the jailbreak process. If it happens again, make sure that the Hex file was correctly installed. Conclusion : Overall, the X3Max x3Jailbreak USB microSD SDHC is a nice product but has some minor flaws. The design is flawed as the USB board wiggles when the back cap is removed. Theres no access to the switch unless the back cap is removed. The screws are really small and the included screwdriver is crap. In order to access the microSD(HC) slot, you would need to remove the back cap, both screws and the aluminum case. It would have been nice if the microSD slot was spring loaded but due to the size of the board, I can maybe see why it was not included. At first, I had a problem with loading Hermes HEX files. But working with X3Max to try and figure out why, X3Max released an updated Generic.bin (1.1) file that solved the problem (file attached). Now all hex's work whether it be Hermes payload or PL3. We'll update the review when we find out more information about the microSD and getting all HEX files to work. But other than the minor nitpicking design flaws and unknown use of the microSD, I'm impressed with the quality and the ability to use any hex you put on it. At the time of this review, this currently does not support the Linux incentive known as AsbestOS. X3Max are working on an update to support it and will be released shortly. Also In the works will be the ability to directly hex edit in the descriptor windows and flash directly to your X3Max. For the coders out there, you will be able to modify payload information without having to recompile/reflash over and over.